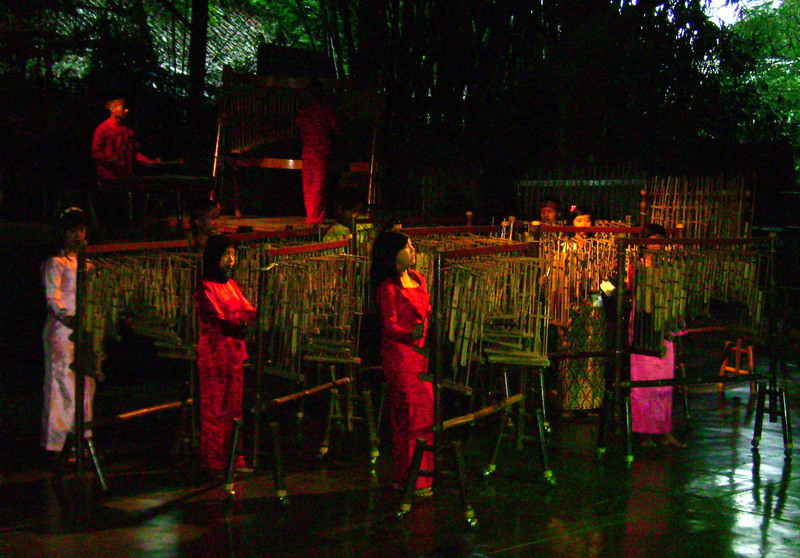 Bandung is the home of a musical arts school called Sang Angklung Udjo. It is here that students from age 3 years and up learn to master the instruments of the Javanese orchestra as well as Wayang Golek puppetry. Both are incredible to witness and are easily a Bandung must see. This was my first time and I look forward to enjoying the experience again. The concert, or as they would rather it be called, demonstration, lasts for a little over 2 hours. If you think that’s a long time to be sitting, a full version would traditionally last 7 hours, hence the term demonstration. It starts out with an explanation of what you are about to witness but the explanation does not do it justice. Not from lack of effort by the emcee but simply because words cannot adequately capture the value of this performance. The two hours consist of angklung solos as well as full orchestral renditions of modern music done in traditional format, childrens recitals, dance, an unveiled puppet show (which for me was one of the highlights as you get to see the puppet masters skill), and an interactive portion. It was the interaction portion which scared the daylights out of me. I am freaked out when anyone tries to make sing in public when I’m not prepared. It’s just not fair of me to inflict that kind of torture on others. Even the thought that this may happen during the course of the evening is disconcerting to me. I remember once on a bus in Rotorua, New Zealand, the driver, on the trip back from a traditional Maori hangi (food cooked in an earthy pit), got everyone to start singing a song from their respective countries. I could feel my heart start to race and sweat beads form on my wrists and forehead. Right from the mere mention of his plan…I wanted off the bus! But, back in Bandung, it turned out to be very relaxing and enjoyable as the entire audience performed various melodies while being directed by the orchestras conductor. It was a group effort and not any one single individual (me) was being put on the spot. The angklung is kind of like the harmonica in that each note is specific to that angklung. So you need eight angklung to play do, re, me, fa, so, la, te, do…am I getting too involved? Entertaining article. Video was a real plus. I have friends in music ministry that travel to Czech Republic and Hungary for things like this but i’ve never watched a video or anything about it. I’m with you about being put on the spot to sing…nervous wreck. lol Thanks for sharing your unique experience. The music is available to see and hear in Bali but this school is actually in the city of Bandung, Java. Why not? would be my reaction to singing for a bit. Looks like a fun time! Even though my heart was pounding I am glad I joined in; makes the memory even better. Although the music is nice, I can’t imagine playing or hearing it 7 hours in a row. Crazy! 7 hours on a concert? Unbeliavable.. how can they resist performing the full version? Nice! I would love to experience this. The music sounds wonderful. I can only imagine 7 hours of this. I don’t know if I could sit for that long though. Seven hours would have to be one heck of a concert. No way my attention span could take it. You’re not alone and that’s why they reduce it to two for us folks that do not have a complete understanding of the story. Thanks for a glimpse of a part of the world and culture I have never experienced Tim. The clip was great and it’s refreshing to see the young musician enthusiastically demonstrating their talents and making such uplifting music with these unique instruments. From what I saw they were all very enthusiastic and it shone through in their performances. This sounds amazing. I too hate solo singing but happy to join in a group. You seem to be visiting the most wonderful places in the World. Everywhere has something wonderful Mina; that’s what keeps me in love with traveling. I am now just imagining you singing TIm that must have been fun. How different is this instrument from the Marimba? Demonstration indeed, that long? It does sound intrguing though. They are a talented bunch Crystal and if you go on youtube you will find a bunch of videos of them and or the angklung. There is an especially cool one of a Rhianna song. I would love to see the Sang Angklung Udjo demonstration. It would be fascinating to get a bit of an explanation and then see and hear the students. I’m with you. Seven hours would be a little much. I would have loved to see that unveiled puppet show. I’m not much for puppets themselves, but I’m amazed at what the artists have to do to get them to work. I always want to see behind the scenes! It was pretty amazing and I’m with you. I love seeing the skill it takes to bring them to life. Tim, this was great and it struck me how much those kids were enjoying themselves. You do have the nicest experiences and I am so grateful you share them with us. Thanks Lenie. 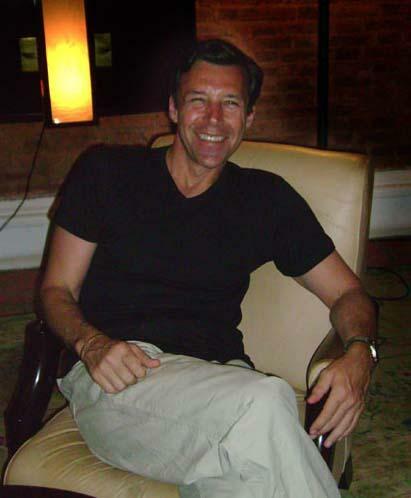 I feel very fortunate to have the experiences I have had and am glad to share them. Gosh I think my husband would love this kind of entertainment! He loves steel drum music and this is just as wonderful. You’re having too much fun! Well, I loved the video and being the ham that I am, do not have a problem being called upon to speak without notice. Singing were surely empty the room because I am tone deaf. Like you, I sing in the shower and in the car. I have never been to the part of the world you describe. Maybe one day. Trying to think of anything that even comes close, and I am drawing a blank. I enjoyed your post! Something totally new for me! Glad you enjoyed it Laurie. The kids at this school were really quite incredible and their talent and enthusiasm extra-ordinary; was a pleasure to be there. Hey Tim, I love the combination of music and puppet artistry and this version is entirely new to me. The fact that one needs 8 angklung to play our scale probably says a lot about the collaborative outlook of the performers. Although not an accomplished singer I would brazen it out, if only to make everyone else feel better about their own performance ! I like that approach to my singing nerves; will put try it out next time the situation arises. This was highly entertaining! I never saw this when I was in the region of the world…but I did see the Monkey Dance in Bali which was very interesting indeed! But I would have enjoyed the puppet artistry also…maybe I should try and get to Bandung 🙂 That angklung is cool! And really…is the voice that bad??? LOL I’m sure yours was among many harmonious tones. It’s no so much that the voice is bad, I think I do a great rendition of Heartbreak Hotel while in the shower, it’s more nerves. It’s that public speaking thing but I am getting better at that. I can speak better than I can sing that’s for sure. I have never been to one of the shows. I am staying in Bali right now and there are many places that offer something similar. I think I will have to give it a go. Hope it is a good as your experience. Personally I don’t know how you could go wrong but as we both know; things do change. I just read your post on Lembongan and loved my time at Dream Beach as well.